This Saturday Norwich City will travel to Everton for what, upon closer inspection, could be a very exciting match. Many people, the bookies included, think that this will be a straightforward win for the home team, that’s why odds on Everton are 4/9 while City are behind at 6/1. However, despite a good start to the season, Everton have been struggling in recent weeks to give their opponents any real trouble. In the last six games they have conceded the opening goal and while they haven’t lost, they have had four draws. 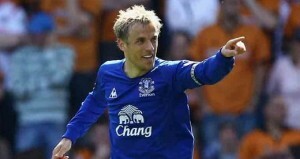 Everton will also be going into the game without Captain Phil Neville who is having knee surgery. It is possible that Darron Gibson may replace him, who is just back from two months confined to the side-lines. The team is also without Marouane Fellaini because of his suspension and there is also doubt about Kevin Mirallas’ fitness. On the other hand, Norwich City is on a five game unbeaten run. They have also managed three clean sheets in a row and four in the last five games. In fact they are looking extremely solid overall and could still do well this season. As a result, Norwich is likely to be tough opponents and Saturday’s match could be far closer than expected.